Below is an account of a dinghy cruise from Bradwell Creek to the Walton Backwaters and back in my 14 foot Wanderer dinghy, along a stretch of coast known as ‘The Wallet’. Visit this Flickr collection for more photos. I slipped W446 into the water shortly after 1000, and tacked out of Bradwell Creek against the last of the flood into a very light north easterly. After half an hour of slow tacking past the old nuclear power station, I resorted to the oars and duly doubled my speed. Happily, the wind soon filled in from the south east and we enjoyed a fantastic close reach past Bench Head and Colne Bar buoys in around 8 knots of steady breeze. We encountered the odd bit of chop around Bench Head where the ebb from the rivers Colne and Blackwater meet, but nothing untoward. The strengthening ebb tide pushed us past Jaywick, and we easily outpaced yachts both new and old as we averaged over 6 knots. The 15 miles of coast between Brightlingsea and Walton is known as ‘The Wallet’. It’s an exposed coastline, bereft of shelter. I was only ever going to tackle it alone in a 14 foot dinghy if blessed with near-perfect conditions, and even then with some caution. Around 1300 we reached passed Clacton Pier, and a few minutes later I spotted the cosy-looking Clacton Sailing Club tucked under the low cliff. This was my ‘point of no return’, at which I had to decide whether to return to Bradwell, or commit to going all the way to the Walton Backwaters. Conditions were ideal; reaching in flat water in a force 2, with plenty of ebb left to help and sunshine galore. The wind eased, and with it my speed dropped to 4 knots as we passed Walton pier and bore away around the Naze tower. I ran in across Pye Sand two hours before low tide. I used my GPS to head for a waypoint marking a dip in the sand bar very close inshore to Stone Point. This seemed to offer hope of a deep-enough channel, though one must always be very wary of what you discern from Google Earth. It’s certainly not on any chart. Just as I thought I’d made it, W446 ran aground in about 6 inches of water. I immediately hopped out and hauled her through ankle-deep water for 20m until I reached the main channel. Phew. It had been touch and go, quite literally. Thereafter the wind freshened nicely to a F3, and I enjoyed brisk tacking up Walton Channel against last of the ebb before arriving at Titchmarsh Marina at 1600. W446 and I had sailed 24 Nm, averaging 4 knots in conditions which could hardly have been more benign. I had no option but to take a small berth in the marina until my return a week later, although the harbourmaster was kind enough to do me a decent deal. I hitched a lift to Frinton, then took the train to Chelmsford, followed by a minicab back to Bradwell to pick up the car. I slept well that night. After catching the train from London to Frinton, I cast off from Titchmarsh Marina at 1100, heading down the Walton Channel against incoming tide. High water was at 1500, and I planned a relaxed tour around the Backwaters, a cruising ground I’d barely explored on previous visits. The wind was light and fickle, so the run down Hamford Water gave me chance to enjoy the attention lavished on W446 by the local seal population. I took a channel south to explore Honey Island, somewhere I thought I might beach the Wanderer for the week until my planned return trip to Bradwell. It is a lovely, isolated location, a healthy 30 minute walk from the nearest road. The wind had by now steadied into a decent force 2 easterly, so I returned to Hamford water, and ventured up Oakley Creek to anchor for lunch. Safe to say the local seal population is healthy, with plenty of young sporting red-tinged fur. I fear for the local fish. With the flooding saltings now bathed in sunshine, I enjoyed a delightful run with the last of the flood to Landesmere Quay, deep in the Backwaters. It’s another idyllic location, but very definitely a private quay. So I returned to Honey Island to beach Wanderer near the top of the tide in a secluded spot on the saltings. I then walked the four miles to Kirby Cross station, from whence home. I left Honey Island at 0900 (high tide) after catching the early train from London. The wind was a heavy force 5 from the north east, and I reefed down tightly, and left the small jib furled. I duly crossed Horsey Mere by following the withies, wishing I had time to explore more. After a brief stop at a Titchmarsh pontoon to untangle the jib furler, I set off again at 1000 heading for Stone Point and the sea. I anchored just inside the entrance, and climbed over dunes to examine conditions outside. 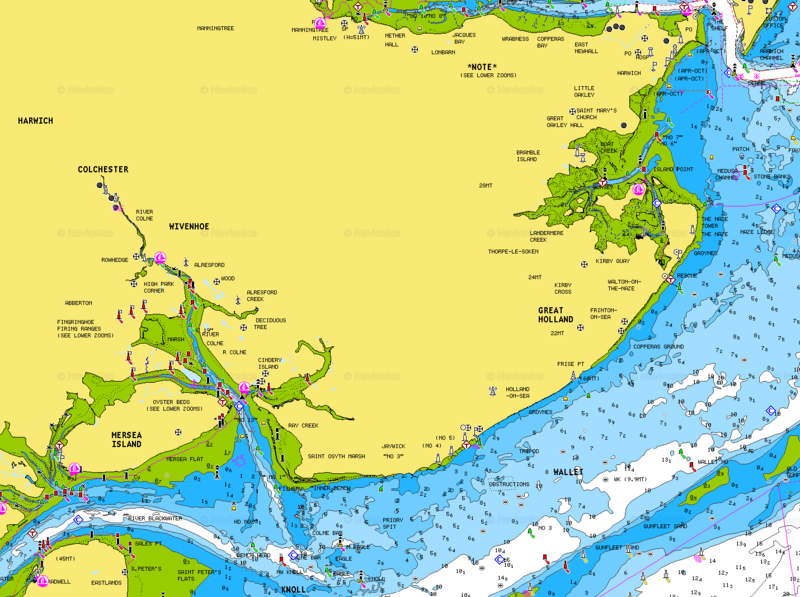 The bar itself looked nasty, with ugly wind against tide chop in the main channel, but I spotted a calmer route out by staying close inshore and crossing the sand bar onto Pye Sand to the south east of the main channel. I’d leave by the same route I came in, albeit much closer to high tide. The wind was still a full force 5, but gusts seemed rare, and though the general sea state was bumpy, there were few breaking crests. The forecast was for the wind to rise slowly through the day, but remain north-easterly throughout, thus ensuring a downwind ride home to Bradwell once I’d turned the corner at The Naze. I decided to go for it, and tacked out of the entrance to the Backwaters at 1030 without incident. Once I’d cleared the sands I unfurled my small jib and bore away against tide towards the Naze tower with Walton pier beyond. With wind against tide the sea-state was confused, and care was needed to stay heading on a safe run. But once goosewinging, the Wanderer is more stable, and tracks more surely through the waves, though I left half the centreboard down as insurance against any death rolling. Before venturing far down the Wallet I made sure I could still head upwind, and that hove-to was comfortable should I need a rest. Both were fine, though I knew that once past Frinton I’d be committed to the full Wallet. Shortly after passing Walton Pier at 1130, an ominously thick fog bank appeared astern. Luckily it never caught up with me, though it convinced me further of the benefits of staying very close inshore to cheat the tide and avoid other vessels. Lobster pots are the main downside. The wind seemed to follow the curve with the coast as we continued on a dead run past Frinton, Frise Point radio mast, and then on to Clacton, passing the pier at 1250. A few minutes later I stopped for lunch and a rest at Jaywick, anchoring in lovely sheltered sandy beach behind a curious crescent-shaped groyne. The wind was now at the top of a force 5, so when I set sail again at 1345 I carried just the jib. I had plenty of time, and the Colne Bar was likely to be bumpy given low tide wasn’t until 1530. I didn’t need to take any chances. As it turned out, it was a bit lumpy, but the wind moderated to F4, and I’d have been OK with reefed main. But a gentle, relaxed 3 knot run home to Bradwell suited me just fine, and we arriving back at W446’s home in Bradwell Creek at 1620. We’d sailed 25 Nm, averaging 4 knots, mostly against tide. Eschewing a pint at the Green Man, I caught the 1700 bus to Southminster, then caught the train home. A satisfying cruise.